The below article demonstrates why today’s private investor needs to be more open-minded than ever when looking for secure, long-term investment opportunities. Whilst retail, high-street properties remain the mainstay of commercial property auctions, medical and leisure investments are increasingly being offered. For the busy private investor this makes auction investing even more complicated, but we are on hand to assist anyone new to the auction market, so get in touch for our unparalleled guidance. The below article is paraphrased from Charlotte Santry’s on the EGI website on 19th Sept ’15. The full article can be read online here. Funeral homes, veterinary practices and dental surgeries are not necessarily the stuff commercial property dreams are made of – but that may be changing. Commercial auction sales are gaining strength; for each of the past five months, volumes have exceeded those of the corresponding month last year. While totals raised have shown a less consistent pattern, and undersupply is still a problem, confidence abounds within the sector now that the economic recovery is starting to pack a punch. Alongside this shift into a different economic cycle is a change in the type of assets being brought to auction, and those most in demand. One example is leisure which, after nosediving during and after the recession, replaced offices in June to become the second-biggest asset class traded at auction, according to the latest Commercial Property Auction Data report. One of the main reasons for this surge, according to Acuitus chairman Richard Auterac, is the post-recession shortage of retail tenants willing to take on leases lasting much longer than five years. “What private investors are looking for is longer-term secure income,” he says, adding that this is particularly true of high-net-worth individuals. As a result, many are looking at sale-and-leaseback deals or embracing parts of the leisure sector, such as restaurants, which often favour long leases to ensure they can stay in their chosen location and benefit from the neighbourhood buzz they may have helped to generate. The popularity of the leisure sector could also be down to the increasing appeal of pubs. Paul Giles, associate director of commercial auctions at Savills Nottingham, has seen a “consistent upwards curve” in pub sales, with big operators selling off batches of properties, having been hit by the smoking ban, cheap supermarket booze and changes in consumer habits. The decline of the pub industry is nothing new: according to the British Beer and Pub Association, 13,556 pubs have closed since 1982. But prices have now dropped to the point that they are within reach of private investors and smaller pub operators, says Giles. Larger pubs with suitable kitchens and seating areas tend to be turned into pub restaurants, while the vast majority of traditional pubs are being converted into houses and flats, he says. The number of pubs being offered has stayed fairly constant over the past year, according to Essential Information Group figures. But, anecdotally, demand seems to be rising. “I don’t think we’re seeing more [pubs], but we’re seeing that they’re selling and the market has picked up,” says Ian Tudor, head of commercial auctions at CP Bigwood. The auction house has been selling mainly closed-down pubs, often in “unsexy locations”, to be put to alternative uses. Pubs are not the only category of properties helping to boost leisure’s relative position against other commercial assets. Gyms also appear to be attracting more buyers – from an admittedly low base point – as their balance sheets improve. “They were mauled after the financial crisis,” says Auterac. “The rents they were paying were far too high.” Many have now changed their business models to become more flexible, offering fewer unnecessary “frills”, strengthening their membership and turning them into a much more attractive proposition to investors, says Auterac. The desire for stable, long-term tenants could make for some niche emerging stars, he ponders, including funeral homes, veterinary practices and dental surgeries. 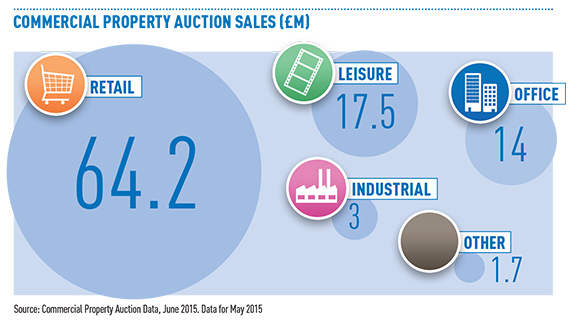 Duncan Moir, commercial auctions partner at Allsop, agrees that these assets have been “risers” in recent years. “As the investors become more familiar with the tenants and their lease structures I would not be surprised to see more of these coming into the market,” he says. But Moir downplays the significance of the rise of leisure, which became Allsop’s second-most popular asset class in the first half of this year, accounting for 9% of sales – the same as the office sector. Offices, however, have seen a steep drop after taking 16% of total sales in the same period last year. Moir puts this down to fears over the end of permitted development rights. “This momentum did not carry over into 2015,” he says. There is no suggestion that retail will lose its place as the biggest asset class in commercial auctions. The CPAD report shows leisure sales totalled £17.5m in May, compared with £14m for offices, £3m for industrial, and £64.2m for retail. The road to recovery has not been smooth, judging by the drop in value of retail property sold at auction over the past year, according to the latest UK IPD Property Auction Index report for the 12 months to 30 June 2015. But the report said the 3.6% decline in capital growth was “against the flow of improvement in the economy and consumer confidence”. One area that is unlikely to see a sudden dramatic upturn in popularity among the average auction-goer is the office sector, believes Auterac. “You have to be a particularly savvy investor to go into offices,” he says, because, in part, of ongoing maintenance requirements.